A difficult task for many golf clubs is maintaining the lengthy pathways that link up the various areas of the course. This requires a lot of maintenance throughout all seasons, including fixing the ground and re-seeding required areas. JungleMulch can offer the perfect surfacing solution for such pathways as it looks natural and sympathetic to surrounding landscapes while taking pressure off players wearing spiked golf shoes. 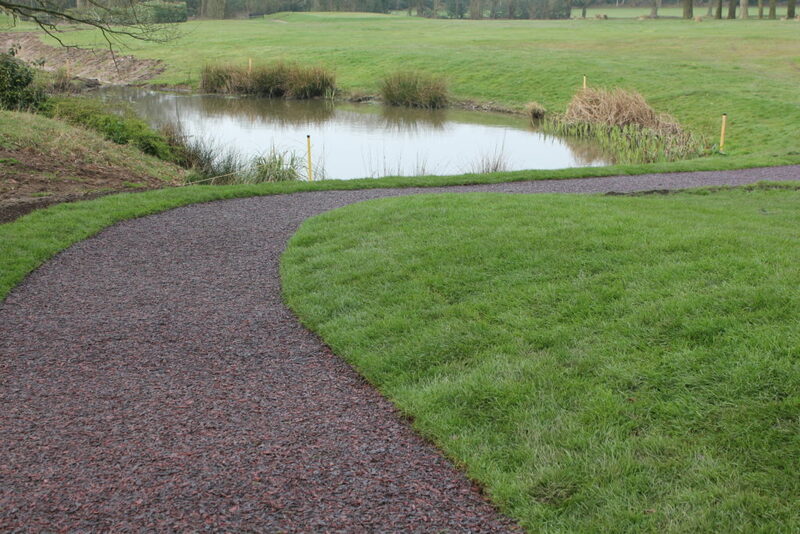 We have used PlaySmart three times in the last three years for our pathways all exceeding over 175m2. The first path is now in its third year and still shows no sign of wear and it carries buggies as well as trollies. Not only is JungleMulch pleasant to the eye and complements our grounds, our members all love the feel when walking on the surface as they say is has a soft bouncy feel. The surface is porous so there are no puddles or mud, it is therefore clean and low maintenance. By the current look of the surface it seems it will last a long time and we feel we made an excellent choice. We look forward to working with PlaySmart again in the future. If you’d like to speak to us about using JungleMulch for Golf Courses or Landscaping, you can reach our experienced team directly on 01564 742 811. Alternatively, why not take a look at our new guide? The guide features JungleMulch as well as our other playground surfacing ranges. Click below to find out more!